The first-ever full-length theatrical LEGO movie follows Emmet (Chris Pratt, 'Parks and Recreation'), an ordinary, rules-following, perfectly average LEGO minifigure who is mistakenly identified as the most extraordinary person and the key to saving the world. Featuring an all-star cast including Elizabeth Banks ('The Hunger Games'), Morgan Freeman ('The Dark Knight' Trilogy), Will Arnett ('Arrested Development'), Will Ferrell ('Anchorman 2: The Legend Continues'), Alison Brie ('Mad Men'), Liam Neeson ('Taken 2') and Jonah Hill ('The Wolf of Wall Street'), 'The LEGO Movie' is one the most awesome animated adventures of the year. Filmmakers Phil Lord & Christopher Miller ('Cloudy with a Chance of Meatballs', '21 Jump Street') worked with renowned animation studio Animal Logic, based in Australia, to create the original 3D computer- animated story and welcomed Chris McKay ('Robot Chicken') as animation co-director. The 'The Lego Movie' competition has now closed. Winners will be announced shortly. Competition opens at 6pm AEST on Monday 30th June 2014 and closes at 11:59pm AEST on Monday 7th July 2014. Five winners will be chosen at random on Tuesday 8th July 2014. To successfully win, entrants must fulfil the above entry conditions before the time the competition closes. Current members/followers are eligible to enter the competition. Only one entry per person. Only one winner per household. To be a valid winner, the entrant must not have won a prize from SWITCH within the last 28 days. Each winner will receive one Ultraviolet Blu-ray copy of 'The Lego Movie'. By entering, you agree to receive occasional emails from SWITCH in the future. If you decide to unsubscribe from these updates, any further entries will not be applicable. Only Australian residents are eligible to enter. 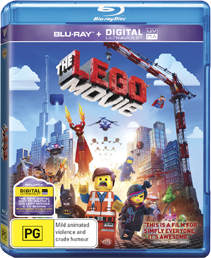 'The Lego Movie' is available on Digital, Ultraviolet Blu-ray and Ultraviolet DVD on Thursday the 3rd July 2014 from Roadshow Entertainment.